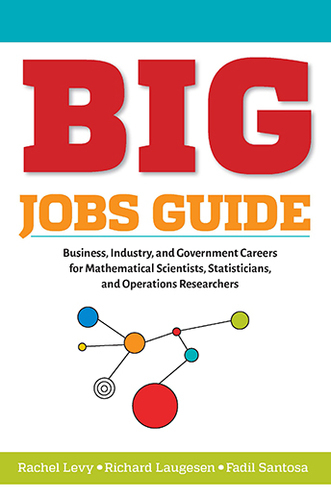 The authors of the BIG Jobs Guide, Richard Laugesen (University of Illinois), Rachel Levy (Mathematical Association of America) and Fadil Santosa (University of Minnesota), talk about the book. Interview republished with permission from Inside SIAM. SIAM: What inspired you to write BIG Jobs Guide? Fadil Santosa: I have been helping graduate students and postdocs start their careers in industry for over 20 years. In fact, of the 18 PhD students that did their dissertations with me, 16 of them are in industry. So I’ve gained some insights on what gets them hired by companies, and I thought it was time to put together a “how-to” book. Rick Laugesen: It was “who: inspired me, rather than “what.” It was my graduate students at the University of Illinois. As graduate director from 2012 to 2017, I met annually with each PhD student to discuss their progress, plan their professional development, and explore career options. Students would ask, “What kind of employer hires a math PhD?” and, more specifically, “Are they going to be interested in me?” Then they’d want to know, “How should I prepare for a career in industry or government?” BIG Jobs Guide answers all these questions! Rachel Levy: Access to useful information about how to get jobs is not available to a majority of students pursuing degrees in the mathematical sciences. Many faculty are not sure how best to mentor students who want to pursue BIG jobs because it hasn’t been part of their own experience or these jobs haven’t been seen as desirable in their departments. What are some of the hottest areas for recent graduates with degrees in math, statistics, operations research, and related areas in the business world? Fadil: One recent PhD got a job at Ford Research in Palo Alto working on autonomous vehicles. Another is at a start-up in San Francisco that makes prototype circuit boards. In fact, some of the more interesting jobs are with start-ups. You can make a much bigger impact but you have to put in long hours and there are risks. My advice is to find a job where the work is exciting and challenging and the societal impact is aligned with your own values. Rick: Machine learning and, more generally, data science are certainly hot right now, but career options abound for mathematical scientists, statisticians, and operations researchers all over the country, in many different fields, and at all different kinds of organizations. The best way to find a satisfying career is to start by reflecting on your own values and priorities. If you know what matters to you, then you can tune out the hype and concentrate on finding an organization that provides interesting challenges, good compensation, and opportunities for growth. To throw out a few examples of the variety of employers that job seekers can consider, graduate students from Illinois have done internships at a beverage conglomerate’s research group, agricultural and construction machinery manufacturers, the customer analytics section of a utility company, an advertising group within a well-known internet giant, a government communications research lab, a public health department, various top Wall Street firms, and several federally funded national labs. These students came from a cross section of mathematical areas—combinatorics, mathematical biology, representation theory, harmonic analysis, algebraic topology, number theory, and so on. Employers are not particular about your thesis area and like to hire mathematical talent, provided you’re flexible and willing to tackle new projects. Rachel: The pipeline into jobs depends on your degree, school, and networking connections. If you’re able to honestly position yourself as a data scientist, you’re likely to be paid more than a statistician, operations researcher, or mathematician in the same company. What kinds of government jobs are good prospects for these same folks? Rick: The national labs hire a lot of master and doctoral students for internships and full-time positions. Many governmental organizations deal with complex logistical issues where mathematical and statistical thinking comes into play, including the Social Security Administration, the Department of Defense, government contractors such as the Center for Naval Analyses and Institute for Defense Analyses, the Centers for Disease Control, NASA, the Environmental Protection Agency, and the Congressional Budget Office. The list goes on. Fadil: I don’t think enough students consider jobs that are related to policy. When they think of government jobs, they think of the labs, but it’s important that scientifically strong people be engaged in governmental places like the EPA, DOE, DOD. People with mathematical sciences backgrounds have the skills to analyze and solve complex problems and support decision makers in government. Why are business and industry listed separately? Aren’t these terms synonymous? Rachel: We might think of industry as making something tangible and business as possibly dealing in finance or software. Another important sector is nonprofits or NGOs, which you might think of as a subset of businesses. We adopted the term “BIG” from a Mathematical Association of America special interest group, which had been in existence for a long time. Fadil: We used to think of business as banks, insurance companies, and service providers. Industry used to mean companies that manufacture products, such as auto makers, computer companies, and appliance makers, but now they’re interchangeable. I don’t think B-G or I-G sounds as good as B-I-G, however, so the B is here to stay! Rick: We needed that extra letter because SIAM balked at “IG Jobs Guide.” Some people make a distinction between “businessy” companies, such as financial firms, and “industrial” companies, such as medical equipment manufacturers. Both types of companies employ mathematicians, statisticians, and operations researchers. What lead you to become not only a mentor but also an advocate for mentorship? Rachel: As an educator, mentoring has always been important to me. Fadil: It’s important that students and postdocs have someone with knowledge of industry to mentor them, and I hope this book will be useful to those stepping into that role. Making students aware of what they have to offer and being a cheerleader as they start their journeys is a rewarding role. Rick: It is really satisfying to help students chart the future course of their life. How do people a few years into their careers transition from, for example, an academic job to one in the business world? Rick: Transitioning from one career—say, a teaching position at a university—to an entirely different one in the business world is overwhelming to many people. What are the first steps in undertaking such a big change in careers? Take a deep breath and remember to believe in yourself. Rachel: Identify who you are and what you want. We talk in our book about how to do this. Fadil: This is a great time for people trained in the mathematical sciences. There is a real unmet need for talents with strong analytical skills. Transitioning is a matter of presenting a portfolio of experiences and demonstrating abilities that companies find valuable—translating your knowledge and experience in academia to competencies that recruiters recognize. You’ve probably done significant projects, so translate one into something that hiring managers will understand and acknowledge as important for the position. Do a few informational interviews. And, most importantly, you need to network. If you could only give one piece of advice to job seekers, what would it be? Rachel: I really like the advice in our book from Nicole Morgan that you need to know who you are and then search for a job that aligns with your values and with the skills you want to use on the job. Fadil: You will need to network like crazy and you need to be properly prepared: have a good resume ready and study ahead of the interviews. Be persistent. Your dream job is waiting for you. Rick: Did I mention buying BIG Jobs Guide? Only $15 for students online at the SIAM bookstore. Or order toll-free in USA and Canada: 800-447-SIAM. Worldwide, call: +1-215-382-9800. Please have your credit card (American Express, MasterCard, VISA, Discover) and book information (including code) ready when you call. If you prefer to pay by check, send orders to: SIAM, Dept. BS1218, 3600 Market Street, 6th Floor, Philadelphia, PA 19104-2688 USA. Outside North America, buy SIAM books through the Eurospan Group via eurospanbookstore.com/siam.